window plus zippered nylon screen door. case and canopy poles at right. Carry Case. Cotton drill. Drawstring. Canopy Poles. Aluminum. Pkg. of two. 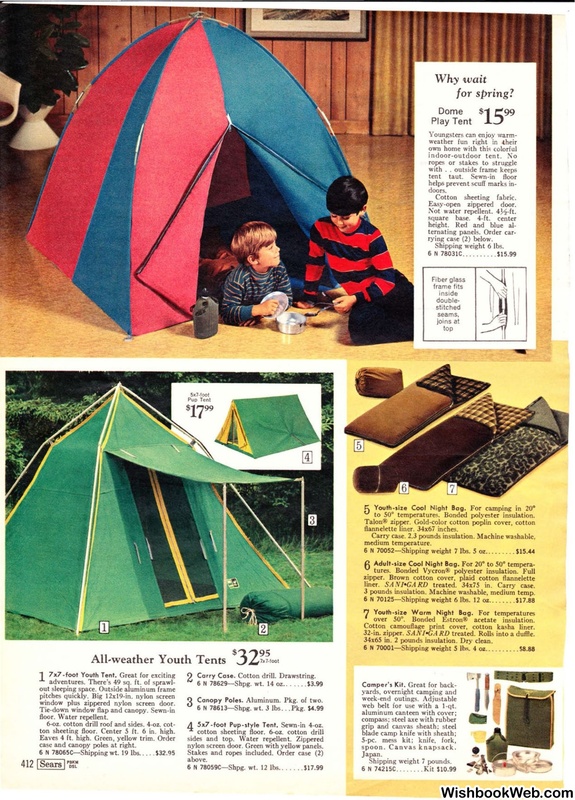 5x7 -foot Pup-style Tent. Sewn-in 4-oz. nylon screen door. Green with yellow panels. to 50° temperatures. Bonded polyester insulation. treated. 34x75 in. Carry case. 3 pounds insulation. Machine washable, medium temp. 70125-Shipping weight 6 lbs. 12 oz. .
over 50°. Bonded Est ron® acetate insulation. Cotton camouflage print cover, cotton kasha liner. treated. Rolls into a d uffie. 34x65 in. 2 pounds insulation. Dry clean. web belt for use with a !-qt.